IT’S been a very long time since I have seen so much rain. 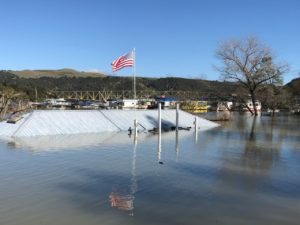 Between the local area images of flooding to a breach in the Oroville dam, there is no shortage of disastrous water news. While thousands of people are fleeing downriver areas, I was presented with my own personal challenge. My art studio flooded. 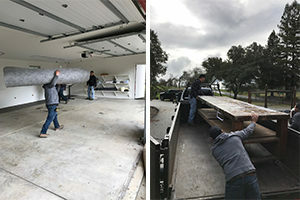 Just when I thought my life was on a steady path… Before this crazy rain, I made the decision to retain my studio that was nestled along an agricultural hillside in Geyserville. I just started to work with new and exciting clients and got into a productive, creative rhythm. Last month, rain began to steadily invade my studio space and everything was soaked. Luckily, the artwork was safe but I had to make a quick decision to remove everything immediately. I continue to be reminded of the importance in being flexible with life challenges. I gathered my two largest commission paintings and got some help moving out. Together, we transferred my studio to my personal home. It created so MUCH mess!! This event really forced me to make quick decisions. I transformed my home office space into a painting studio, lining the doors with plastic to mitigate paint fumes from going into my living space. Ultimately, this ready-made studio allowed me to continue my commission work without major delay. Reflecting on this emotionally and physically exhausting experience, I was very aware that I needed a serious attitude adjustment. I have a space to continue my work. ALL IS GOOD! I am grateful for the flood but still adjusting. My intention is to live from a place of acceptance and gratitude…no matter what. Lately, my time is spent making plans to add storage and studio space so I can make a big mess. I am continuing to get to a place of acceptance. So why am I sharing this story with you? Everyone experiences challenges in life. With every challenge there is an opportunity to rise above and grow. While the answers to life’s trials may not be immediate, they come in time and we are better for it. I love this story for so many reasons. For the honest sharing, for the intrigue of the adventurousness of the unknown of what will happen next…and most of all because of the reminder that change is gonna come. (Insert Dylan tune here). Just when you thought you had an idea of where you are, having a handle on things, there is a shift, a change of mind, or a LOT of water! This is the creative process. “What’s here now?” Thanks for sharing Sargam. You are well and doing the work you love. This is what counts. Gratitud is a lifelong lesson.